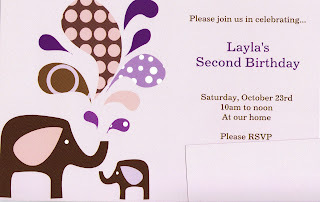 For Layla's birthday party, I had planned on a purple theme, since that appears to be her favorite color. It was either that or Lady Gaga..and I wasn't sure how to pull that off for a two year old. I always have to order my invitations...it's an uptightl thing and I totally acknowledge that it's a problem. So, here are the invitations that I found that seemed just perfect. So, naturally, everything else followed. And instead of getting cute purple treat bags and filling them with inexpensive toys and candy, I thought "Hey, I could make each kid an elephant." ﻿When I decided to do this, I sort of forgot about siblings. So, I did end up needing 12 of these little guys...but it wasn't really all that bad. Here is a look at the final product. Looks so pretty with all the different fabrics, don't you think? I definitely simplified this project in order to make so many of them. If I were just making one for a gift or for Little Bean, I would probably do it a little differently, and I will make notes as I go on what that might be. First, you need your pattern. 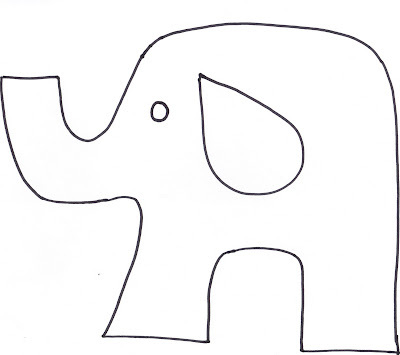 I just free handed an elephant (using the invitation as a guide) on a sheet of paper. Feel free to blow it up as needed. ﻿To make this project super easy and inexpensive, as I mentioned above, I used fat quarters. They happened to be on sale for $1 at JoAnn Fabrics. Now, it's no secret that these fabrics are poorer quality. So, you can save yourself some grief later by adhering some medium weight fusible interfacing to the backside of the fabric before you cut out your pieces. I learned this by mistake once I was almost done. I have to say, I did like the result much better. It's worth the extra cost and time. So, to start, I folded my fabric in half and then laid the template on top so that I could cut the front and the back simultaneously. This is super important. You want both pieces to be identical. Once your elephants are all cut, lets stitch them together. Here is the MAJOR shortcut. Instead of putting the right sides together and stitching on the inside (which would require you to flip the elephant inside out later), I put the wrong sides together and used a zig-zag stitch all the way around the outside edge (leaving a hole to put your stuffing in...I found that the back leg worked the best). This saves so much time, I can't even tell you. If you use interfacing, you won't have much fraying here at all. If you don't, you may need to go back and trim the edges once you are complete. Now, it's time to plug in the iron on steam setting. Here is a pic of the double sided fusible web that I used and it worked really well. Follow the instructions on the package you buy. This brand has you peel off one side and stick it to the fabric...it will REALLY help if you iron out your fabric first. Now stop with the iron. Once you have this done. Cut out ear and eye pieces for one elephant. Peel off the paper from the web. Align them where you would like them and iron them on for about 15 seconds. 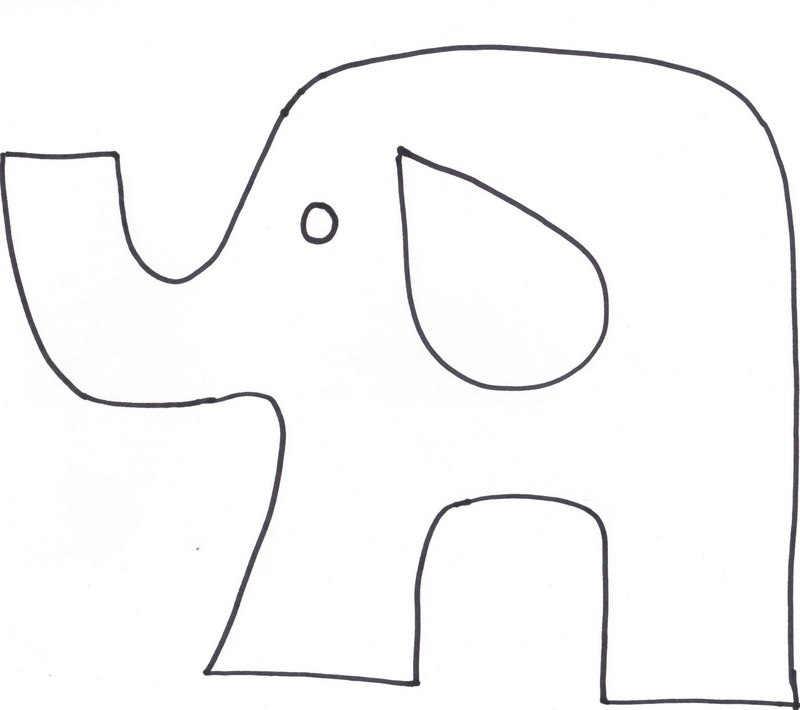 Flip the elephant over and repeat on the other side - you should be able to feel the existing ear/eye so that they will be in the same place. Now, invite your mother over for tea and put her to work. Just kidding Mom...but thank you over and over for your stuffing help! Use a chopstick to get the stuffing into the trunk and the front leg. Once your elephants are stuffed, stitch them up with a zig-zag on the machine. Yep, NO hand sewing! If you are only doing one, your stitches are all hidden, so you would want to do a slip stitch here to polish it off nicely. Last step: get your scissors out and snip the loose threads around the edges to make them look polished. You could really do this with any animal party theme. Just remember to simplify what you are doing and it is all very possible. I just love these elephants!! What a great idea to use them as favours!! Would you allow me to make some for markets / fb store?? I was thinking of doing this project for my SIL's baby shower and stuffing with a light lavender potpourri. The elephants can go in sock drawers or even a baby's dresser? This is the same shape of the curtains and crib skirt and other items I made for my soon to be grandson's room. I would love to make these stuffed elephants. Thank you so much for the inspiration! !